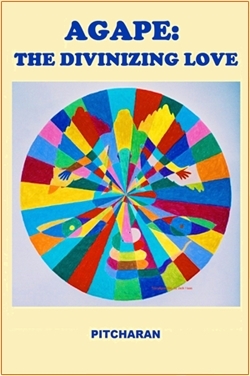 This book is an effort to bring out the centrality of agape in the divinization of humans. The terms agape and divinization are not defined at the outset and their gradual understanding is the intended motive of the book. The first part―THE TREE OF LIFE, is a depiction of the amazing power of sacraments which are seen as extraordinary aids for all those who choose to draw near to God. A lingering desire since the last two years is now fulfilled in this part of my work which is an experiential understanding of the sacramental salvation process. How to worship God in spirit and truth? What is the theology behind suffering? These and many more such theological insights gained while quenching divine thirst are presented in the second part―THEOLOGY OF DIVINIZATION. The third part―THE STRUGGLE, presents an elaborate outline of the whole divinization process with a finale which is an approach to perfection based on Trinitarian dynamics. The last part is a stand-alone synchronous meditation on the WAY OF THE CROSS, in a manner that explicitly reveals THE DIVINIZING WAY. PARABOLIC REFLECTIONS is a conducted tour through some of the parables of Jesus. Though not a part of the main book, this earlier work is revisited and included as an APPENDIX, in view of the immense guidance value.